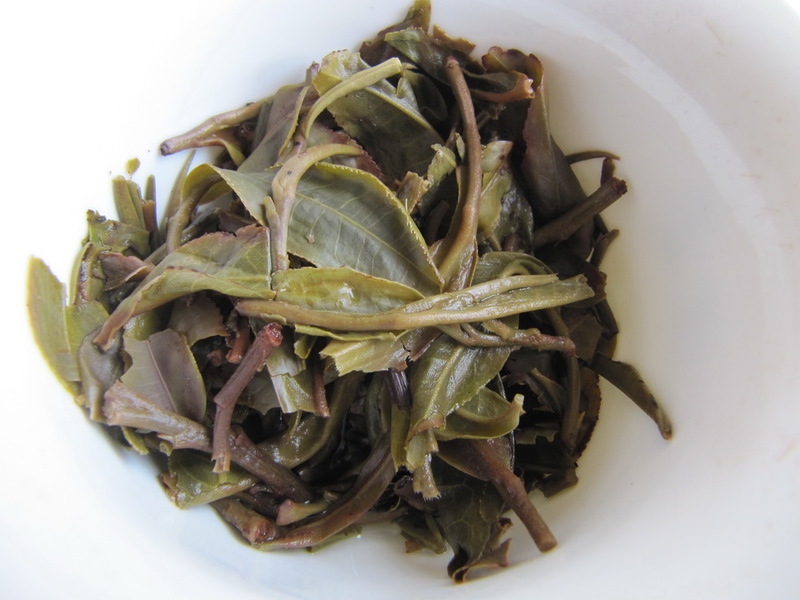 The leaves for this Cha Lao Guai Gao Shan cake were picked very finely (nen) which brings a little extra astringence. It is not unpleasant, transforming as it does quite quickly. There’s an expression here: “yi ku, er se, san hui tian” 一苦，二涩，三回甜. An expression that says that the first leaf, or tip brings bitterness , the second astringence, and the third sweetness. Part of the logic for why Puer is not picked as finely as some other teas. But, before we get started, the bad news is that what you see in the pictures is all there is left of this tea, though I’m hoping Cha Lao Guai Lao Ban is going to stumble across a jian somewhere in his store. The initial flavour is light, carrying flowers and citrus notes, the second steeping has hints of tobacco while building the sweetness. The feeling in the throat is comfortable, smooth, and, despite it’s lightness the tea sinks quite well into the thorax. Some bitterness lingers on the upper palate. The huigan lasts for some time after the tea has gone, with lingering floral notes floating up into the nasal cavity. The rukou feels slightly choppy, but this changes soon enough to a rather smooth, well coated feeling in the mouth. The tea has some substance – with a good houdu – thickness that makes me feel like I would have liked to have had a tong to keep for a few years to see how it might turn out.